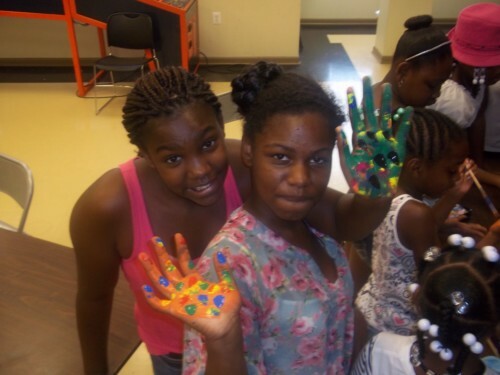 L to R: Kaimerei (12) and Kennesha (12) learning about art through hands-on activities at the Boys & Girls Clubs’ Summer Camp program. The Boys & Girls Clubs of Annapolis Gardens and Admiral Oaks have joined forces with the Blacks of the Chesapeake Bay Board to present “Exposing the Arts: The World is our Classroom”. The ceremony on August 9th will include the unveiling of a 42 foot wide by 8 foot high mural, a collaboration of art created by more than 30 local youth. The mural is being designed by youth ranging in age from 8 to 12 who are part of the Boys & Girls Club Summer Camp program, with assistance by Kim Falcot from Maryland Hall for the Creative Arts. The unveiling ceremony will include a performance by the dance group “Young Evolution”, lead by Kendra Adams, and artwork designed by Summer Campers. Speakers will include local historian Errol Brown, Dr. Randolph Rowel from Morgan State University and Emily Garvin, Director of Programs at Maryland Hall.